July 29 2009. This symposium is part of the wider efforts being made by both organisations to combat the persecution of children in Nigeria due to the belief in witchcraft. In the past ten years thousands of children alleged to be witches and wizards have been tortured thrown out and abandoned by families in Cross River and Akwa Ibom States due to this belief. "This symposium is a welcome development", says Leo Igwe, executive secretary of the Nigerian Humanist Movement. "Witchcraft accusation persists in Nigeria because there has not been a properly coordinated public awareness campaign to get the people to understand that witchcraft is superstition and that witches and wizards are imaginary entities. Unfortunately Nigerians go through life believing in witchcraft. In their families, schools, churches and mosques, in the media and the local films, Nigerians are made to believe that witches are real and potent, and that witchcraft is effective Nigerians need programs to educate and enlighten them to abandon the belief in witchcraft and other superstitions and embrace reason, science and free inquiry. Until Nigerians abandon the belief in witchcraft, the atrocities committed in the name of this bloody superstition will not stop”, Igwe added. 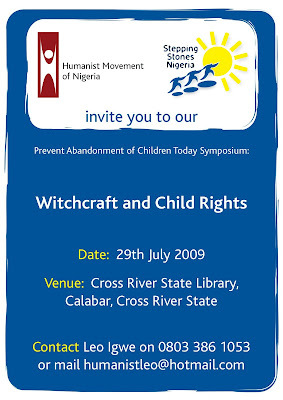 Speaking from his office in the UK, the Programme Director of Stepping Stones Nigeria, Gary Foxcroft, said, "This timely symposium further highlights Stepping Stones Nigeria's commitment to eradicating the abuse of child rights that often takes place in Cross River and Akwa Ibom State's due to the belief in witchcraft. This erroneous belief is clearly being spread by a small number of powerful pastors and evangelists who are making a great deal of money on the back of falsely labeling children as 'witches'. We hope that this symposium will help to encourage the Cross River State Government to hold such false prophets to account and prosecute them under the recently enacted Child Rights Act". i feel sad when i read about these happenings in my state..these outrages championed principally by "houses of God",have turned children and old women into endangered species..i pray sanity returns and soon.